I spent my Friday morning at the Virginia General Assembly to lend my support for House Bill 1940. For those of you unfamiliar with Virginia’s legislature, our General Assembly is made up of 40 Senators and 100 Delegates who convene every January for either 30 or 60 days. On Wednesday, Delegate Tag Greason introduced HB1940 to end the age cap on autism insurance coverage in our state. A little background… In 2011, our General Assembly passed a law requiring insurance companies cover autism therapies, specifically pharmacy care, psychiatric and psychological care, speech therapy, occupational therapy, physical therapy, and behavioral treatment. When it comes to behavioral treatment, applied behavior analysis (ABA) is specifically mentioned, with a cap of $35,000/year. Besides the monetary cap, the age is currently capped at 6. We all know autism does not magically go away when a child turns 7. Both Matthew and Wesley receive ABA. We have been blessed to work with wonderful providers and both boys continue to make gains with this treatment. Because of ABA, Matthew regained many skills he lost after a massive regression, working on academic, language, self-help, and social skills. 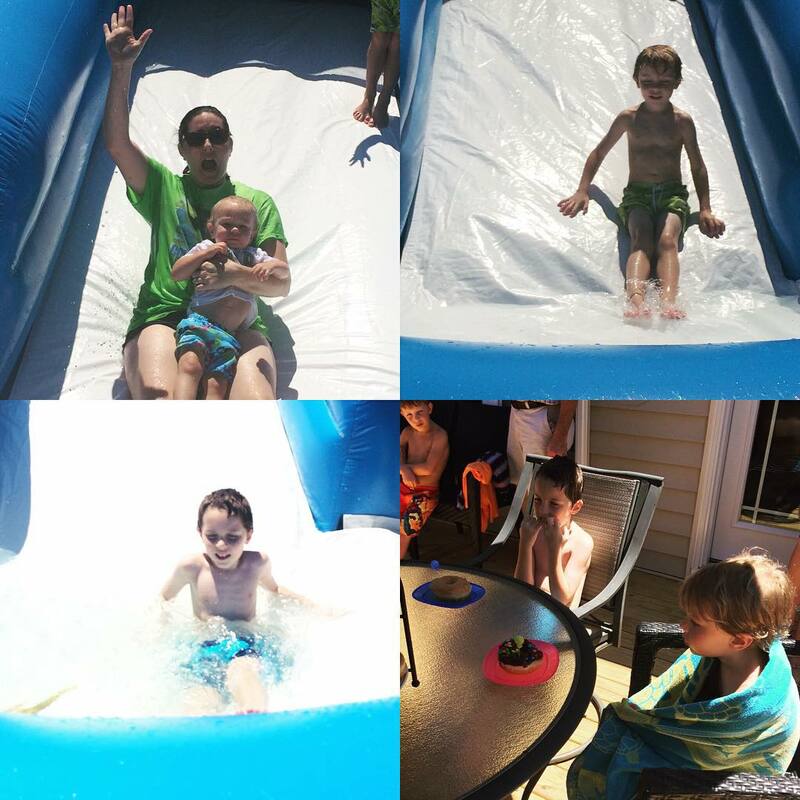 Because of the insurance mandate, we could afford to enroll Matthew in The Founders Center of Commonwealth Autism until he turned 7, which is where Wesley goes now. Matthew currently receives home-based ABA before school two mornings every week. When Matthew aged out of the insurance mandate, we were not left high and dry because he also receives funding via the state Medicaid system. We went through various screenings when Matthew was 3 years old and were found eligible for EDCD and ID waivers, which granted Matthew Medicaid benefits based on his personal income, not our family income. The waivers are complicated and bureaucratic; but in a nutshell, Matthew had to fit a criteria for nursing home care to receive EDCD benefits. The social worker who evaluated Matthew told me this particular waiver was intended to keep the elderly and mentally disabled with their families and out of institutions. This is the system we’ve been thrown into. I feel so horrible for friends who cannot access these services for their autistic children, but it’s symptomatic of a much larger broken system, which I tried to convey to the senators, delegates, and legislative aides I met today…My husband and I are both college graduates, employed full time, regular middle-class suburbanites. We should not rely on Medicaid for services. Knowing that opposition to HB1940 seems to be the thought that it will cause health insurance premiums to skyrocket, I used my own family as an example. The state can continue to pay Matthew’s outrageous ABA bills, or let private insurance do the work for mere pennies to the consumer. 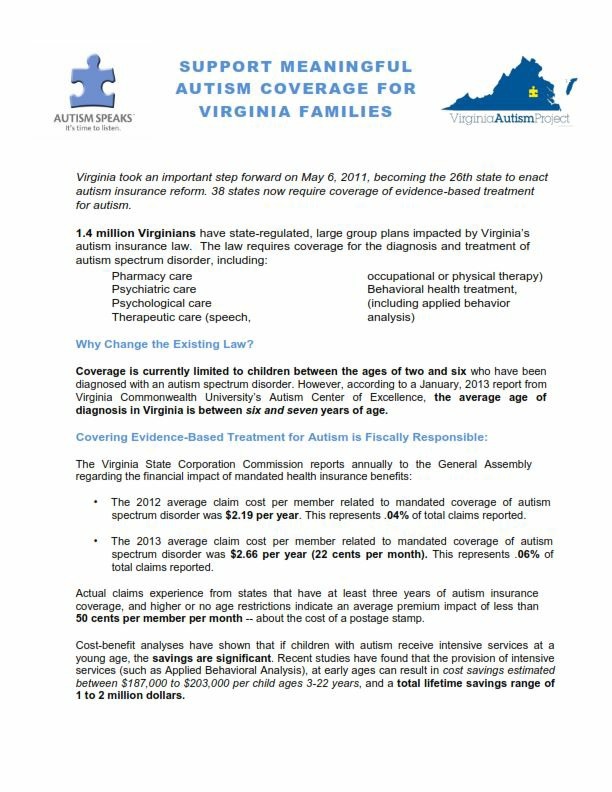 Last year, autism claims raised premiums $0.22/month in Virginia. $0.22 and people want to cry uncle. “Oh.” Seriously, he looked sad. I did my best to give him my spiel about Matthew and Wesley and the $0.22/month thing and how much I hate Medicaid in our 120 seconds together. He suggested I make an appointment to meet him for coffee when the General Assembly is not in session. In my mind, I was thinking, “A-hole, I need your attention right now, not in March.” Instead, I thanked him for his time. Then he hollered for the doctors. Senator Martin is on the Autism Advisory Council, and I’m his constituent. I was not expecting our meeting to be so disingenuous. If I could insert the sound of a balloon losing air and flopping to the floor here, that would describe how I felt. Deflate. Sputter. Flop. I met up with a group from Autism Speaks, including several legislative aides and the organization’s Director of State Government Affairs. They were all amazing, smart women. They learned that an identical bill was being introduced in the Senate today. I joined them in meetings with Senator Richard Stuart’s office and my delegate’s office, Manoli Loupassi. Their staff listened, asked questions, and genuinely seemed interested in learning about the bill and how current coverage impacts families. I was asked how our costs are affected, and what are the going rates for ABA, speech therapy, etc. They wrote those numbers down. How many hours of ABA did Matthew get under the insurance mandate? How many hours does he get now? What’s the difference between that school he went to and what he gets now? All good questions because it shows they were trying to understand the problem beyond a sheet of talking points. I got a follow-up e-mail from Delegate Loupassi this afternoon thanking me for sharing information with his aide, and he provided his cell phone number for any additional comments, concerns, or questions. Now that’s amazing. 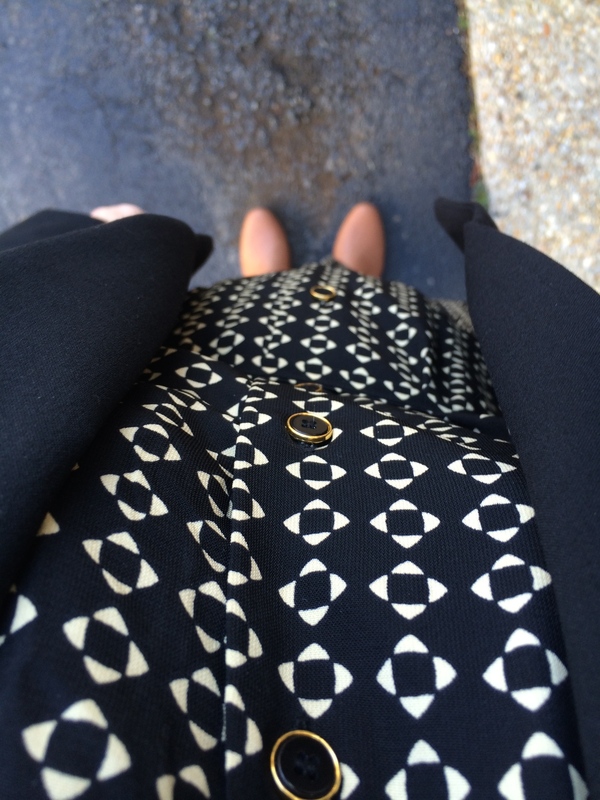 Then I came home and took a picture of my outfit. I rarely look put together. The people from Autism Speaks asked if I would be available to come back for committee meetings. Sure, why not. My name is _____, and I live in your district. I want to call your attention to a bill that is very important to me, my family, and my community. Please support House Bill 1940. This bill recognizes that autism does not go away when a child turns seven, and medical treatment is often still necessary. 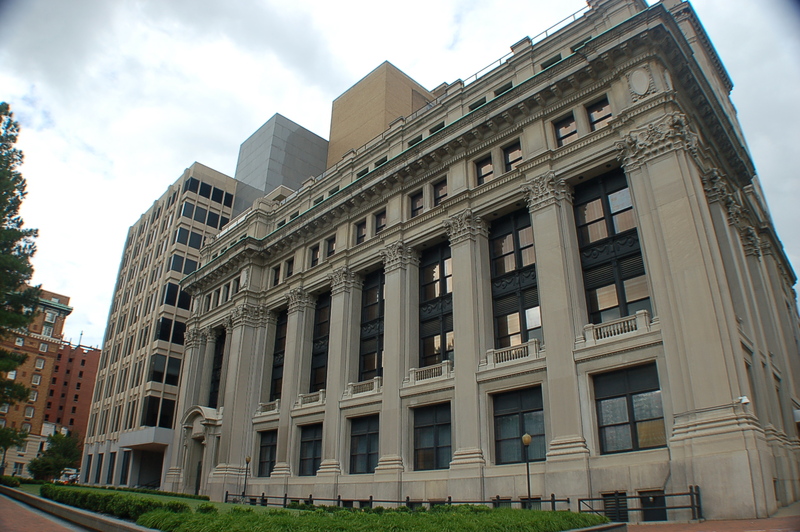 The Virginia State Corporation Commission reports that the average annual claim cost per member for 2012 and 2013 were only $2.19 and $2.66, respectively. Actual claims experience from states that have at least three years of autism insurance coverage and higher or no age restrictions indicate an average premium impact of less than 50 cents per month, yet recent studies show that intensive services can result in a total lifetime savings range of $1-2 million dollars! I sincerely hope I can count on your support. Feel free to share a personal story about how autism has impacted your life.